The promises of wealth and the threats of destitution that [capitalism] holds out, it redeems with ruthless ineptitude... They are not proffered at random; yet there is a sufficiently enticing admixture of chance; the game is not like roulette, it is more like poker. Perhaps the great ideologue of 'creative destruction' would have gained a better insight into humanity had he spent some time sitting in a library in Hull. Here's a piece of genuinely bizarre and even disruptive evidence, on the relationship between economic behaviour and economic rhetoric. The European Innovation Scoreboard 2005 studies trends in both innovation and attitudes to innovation across the EU. And, without any explanation, both Germany and Finland find themselves ranked in the top five of both innovation leaders (that is, actual innovators) and as the countries whose citizens claim to be 'least ready to embrace innovation' (Finns in 'we hate innovation shock!' Who'd have thought it? A few years ago, everyone was under the impression that Finland was one long, innovative Nokia-hosted innovation party). - Citizens of these countries consider a high rate of innovation to be 'normal', and thereby don't recognise their unusually high rates of innovation, in the same way as fish don't see water. - There is some sort of zero sum game at work between consciousness of innovation and actually getting on and doing it, i.e. the people who bang on about it the whole time (e.g. the UK) do so because they're so bad at it, just as people bang on about 'community' wherever it is least apparent. What is it about the 'market' that the traditional Left has been against in recent times? If one adopts Fernand Braudel's distinction between 'the market' and 'capitalism, in which the former involves "transparent exchanges" and the latter "unequal exchanges", it becomes unclear why it is the former that has been such a constant focus for political attack in Britain, and not the latter. Perhaps being anti-capitalist seems too radical, too implausible, whereas being anti-market might appear more moderate or democratic. And yet it is capitalism that is unwieldy, destructive and rooted in complicated illusions, not markets which exist merely as places in which strangers might meet and objects might move. I was reminded of this at the weekend at the Barbican's In the Face of History exhibition, when I came across some stunning Woflgang Tillmans photographs taken from an exhibition of his called 'Markt' (see one of the photos here.) 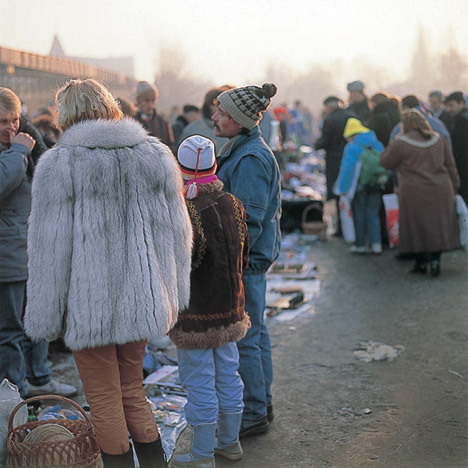 The photos are of a semi-legal Polish marketplace in which people gathered during the last years of communism to buy and sell random and somewhat pitiful objects - a sheet is laid down on the ground and maybe a single shoe, a pencil and a raw sausage placed on it for potential purchasers to inspect. It looks not dissimilar to the street market where Bethnall Green road meets Shoreditch, which is (or was last time I looked.. ) full of amateur traders displaying their wares of used video tapes, bicycle saddles, broken cutlery. This is the market as public space, individualistic for sure, but more in the spirit of Walter Benjamin than Hayek or Friedman. What's more, the market can subvert in interesting ways - as eBay briefly showed with the Live8 fiasco - whereas capitalism can create and destroy, but never democratises, beyond its initial act of disempowering the aristocracy. And yet mostly, the distinction between the market and capitalism is made in the sickly tones of petit bourgeois conservatism. Hugh Fearnley Whittingstall's latest plan is to take on Tescos through his own chain of food stores. He argues (about Axminster) that "the only place you can buy fresh fruit and veg on a daily basis is in the two supermarkets, which are Tesco and the Co-op. There is a sweet little market every Thursday and a wonderful farm shop a few miles outside town, but I feel that small producers like that should be represented in the middle of town on a daily basis". What is the nature of this 'should' - aesthetic or political? I suspect the former, and Fresh and Wild type enterprises tend to internalise this aesthetic in their absurd prices, leaving Tescos as the more genuinely democratic option. At least Tescos pass on some of their And that, as any inhabitant of a gentrifying neighbourhood can tell you, is where we're gradually heading: markets for those who can afford it, capitalism for everyone else. The full programme and details of call for papers is here. Email me for more details or if you want to come/speak. I've long been interested in the advertising strategies that induce us to embrace our preordained digital future. In this piece, in which I tried to develop a critique of the infantile egocentricity that is unleashed by 'digital exuberance', I used Ocado's advertising strategy as an example, where the online customer is invited to identify with a screaming toddler and the demands, "I want my groceries delivered in hour-long slots. And a monkey. Who'll eat my sprouts!" Here are two more quite striking examples. - A new advert for a Nokia phone and MP3 player. The image is of a 30-something man, alone during a coach journey, with headphones on and a broad smile on his face, and the accompanying slogan "That song that makes you phone the friends your girlfriend doesn't like". Perhaps it's just a way of bridging the function of a phone with that of a music player, or maybe it's just the dregs of the post-Nick Hornby cult of the childish adult male. But what struck me when I saw this on the tube yesterday was the horrid way in which this product is aimed at creating a sphere of intimacy or privacy that excludes one's girlfriend, and nurturing an experiential realm that is more precious and enduring than any relationship. The psychological promise of this technology is that, through it, you will achieve an identity that is impervious to the risks and tribulations of dealing with and caring about other people. The man in the advert is peaceful and happy not only because he is alone, but because he is safely locked in the womb of his uniquely personalised music collection where nobody can touch him, and there is nobody who might interfere with him or apply any limits to his choice. As Zygmunt Bauman has argued in Liquid Love, 21st century ties are never bound so tightly that they cannot be untied on the whim of either party. A great deal of digital technology is sold as a means of squaring this circle: being connected via a flexible, personalised machine is a means of avoiding loneliness without risking commitment. 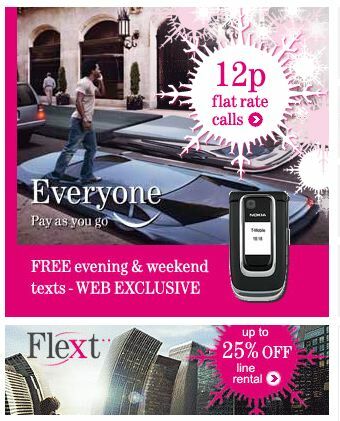 - These T-Mobile adverts have been around for some time, depicting a world that yields physically to the desire of the consumer, alongside the slogan 'the world's not so rigid any more'. This is a reference to some flexible price plan, but the promise is of a higher order flexibility, in which reality becomes malleable, unobstructive and egocentric. In fact, a reality that is structured according to individual desire is no reality at all, but a form of idealism or solipsism in which the world becomes a projection of the self, something that Piaget identified with the cognitive phase of very young children (I don't doubt that Lacan had much to say on this as well).